This is a great, indulgent no-bake cake. Lots of amazing rich flavours – fresh cherries, dark chocolate and crunchy granola. It’s a bit of a bodge recipe, chucking in handfuls of lovely tasty ingredients, you can add whatever you like – dessicated coconut, honeycomb, glace cherries, enjoy! 350g dark chocolate, 120g butter, 2 tbsp golden syrup, 2 tbsp milk, a handful of – hazelnuts, fresh cherries, granola, raisins, and whatever else you fancy. First of all melt the chocolate in a bowl over a pan of boiling water. When the chocolate has melted add the butter and syrup and stir everything together. Take the pan off the heat when everything has melted together. Add the milk and leave to cool while you chop the cherries into quarters and remove the stones. Add the granola, raisins, cherries and hazelnuts to the melted chocolate and then stir everything again. Cover a 1 inch deep baking tray with cling film and grease it with butter. 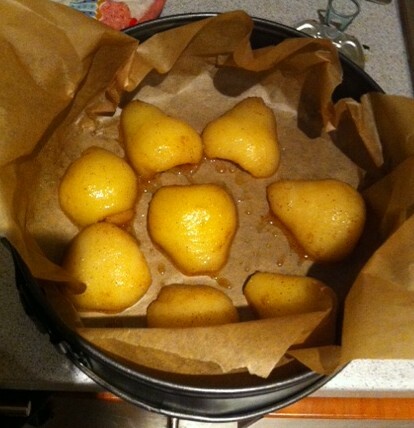 Pour the mixture into the baking tray and then pop in the fridge for 2 hours. Chop into nice chunky slices and enjoy. This is a lot tastier and cheaper than shop bought cereal bars. It’s probably not the healthiest of snacks but it’s fresh, delicious and easy to make. I had my in laws up for Easter this year and wanted to make a really special dessert that would feed 6, 2 of which had given up chocolate for lent! I thought about warm puddings, cheesecake, torte, all sorts, so I decided to make a combo. This was a seriously amazing dessert, super indulgent, really tasty and just so naughty! A crunchy ginger nut base, a layer of chocolate torte, topped with an almond cream – this is a real showstopper. Make it the day before you plan to serve and don’t think about the calories!! You will need: 1 pack ginger nuts, 100g butter, 300g dark chocolate, 700ml double cream, 4 tablespoons golden syrup, 3 tablespoons soft cheese, 50g ground almonds, 4 tablespoons cinnamon, 4 chocolate bunnies, cocoa for decoration. First of all empty the pack of ginger nuts into a large bowl and crush them until they are like breadcrumbs. Melt the butter in a pan and add the gingernut crumbs to the pan, add the golden syrup and stir until everything is combined. Cut a circle of greaseproof paper the size of your tin and place it in the bottom. I used a large springform tin. Pour the gingernut mixture into the bottom of the tin and press down with the back of a wooden spoon to make a flat layer. Cover the top of the tin with clingfilm and pop in the fridge. For the chocolate torte layer, break the chocolate into small pieces and melt in a bowl over a pan of boiling water. Measure out 500ml cream and the chocolate starts to melt stir in the cream, a little at a time. Keep stirring with a wooden spoon, add a tablespoon of golden syrup and 2 tablespoons cinnamon. When all the ingredients are combined, whisk in a large electric mixer until little bubbles start to form then pour the mixture over the gingernut base. Clingfilm the top of the in again and leave in the fridge for another hour. For the almond cream topping add the rest of the cream to a large mixer and whisk until it starts to thicken. Add 2 tablespoons cinnamon, then the soft cheese. Keep whisking everything together, then add the ground almonds. 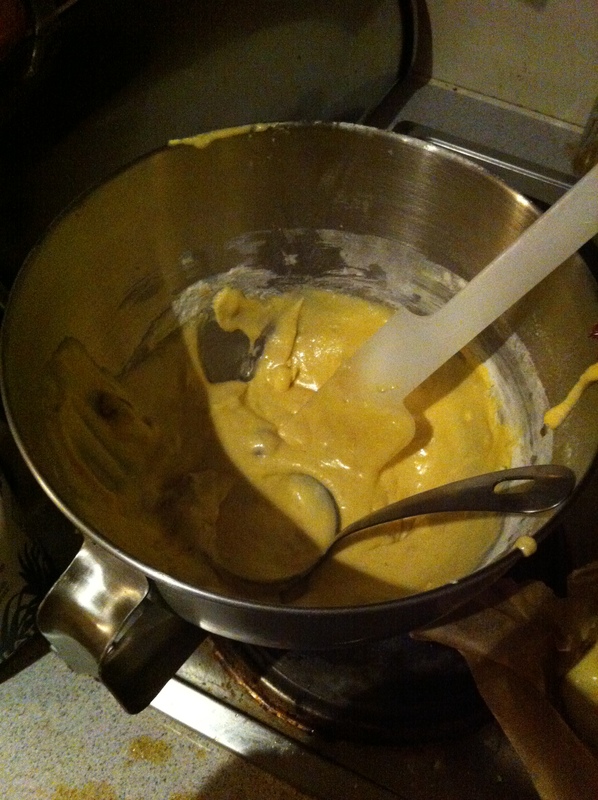 I whisked my mixture for about ten minutes until it formed a lovely thick creamy texture. Check in the fridge that the torte layer has set, it should be firm to the touch. Then spoon the almond cream onto the torte layer. Use a wooden spoon to flatten the top. Place your chocolate bunnies on the top and sprinkle with a little cocoa. Cover with clingfilm and leave to set in the fridge overnight. When you are ready to serve the cake, release the springform sides of the tin and lift it off. Place the cake onto a plate or a cake stand and serve! This is one of the most complicated recipes I have created, it is also one of the best. I think it’s great to have a lovely, restaurant quality dessert for special occasions. The almonds, chocolate, cinnamon and ginger complement each other perfectly and this is a perfect Easter treat. 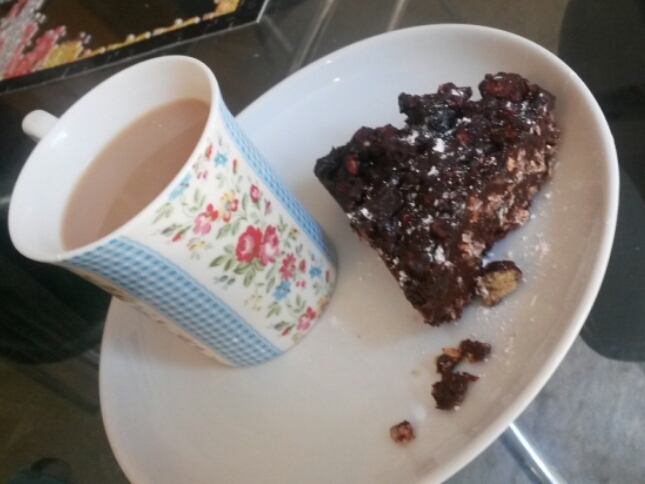 Well I thought my chocolate fudge traybake was a success so I decided to do another! I had some bananas in that were past their best (I like them when they are green!) 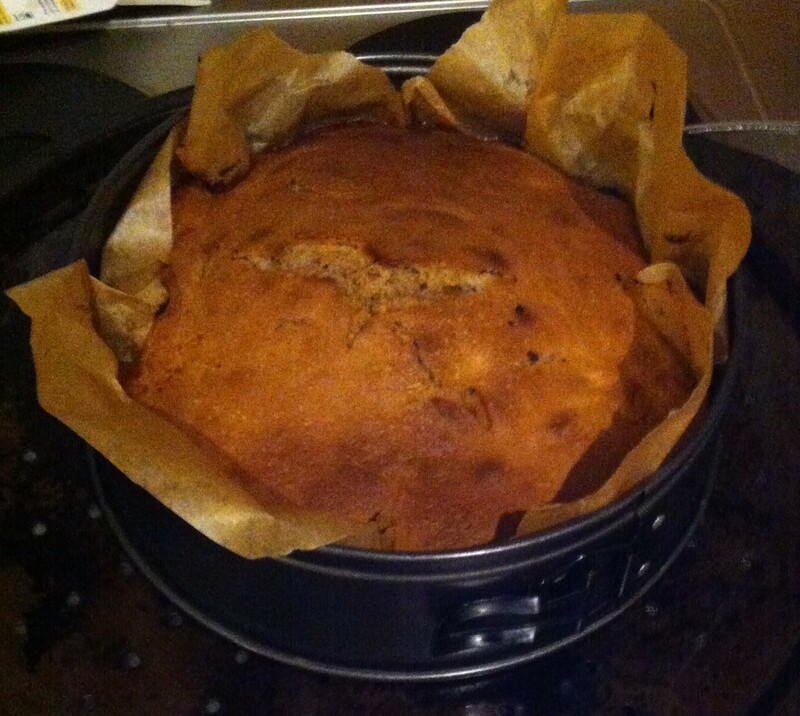 so I decided to make a banana based cake. I must admit it was a bit of a throw everything in and hope for the best recipe, but it tastes great! Instead of just banana bread, these tasty squares are packed with raisins, nuts, maple syrup and bananas – awesome! 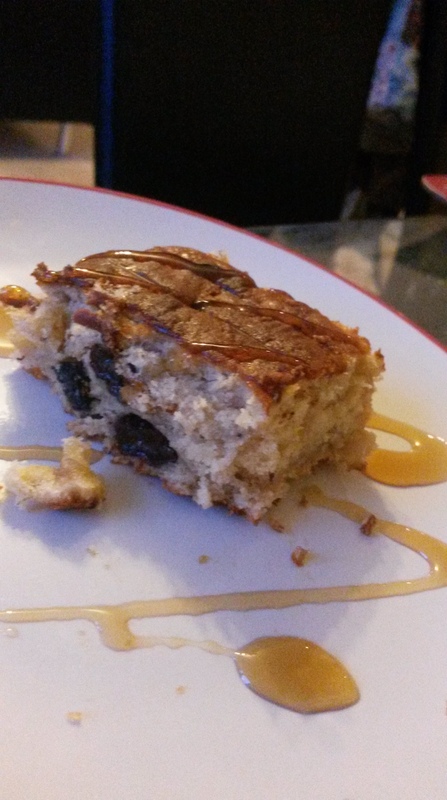 You will need: maple syrup, 150g sugar, 100g butter, 100g self raising flour, 25g plain flour, 3 overripe bananas, 40g chopped nuts, 2 eggs, 2 tablespoons milk, 50g raisins. 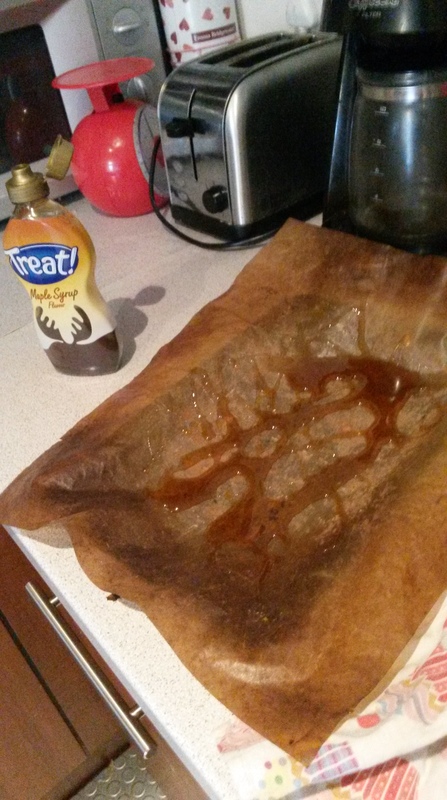 First of all preheat your oven to 190 degrees and line a baking tray with greaseproof paper, then pour a couple of tablespoons of maple syrup onto the greased baking tray (it makes the top of the squares lovely and gooey). Mash the bananas in a bowl with a fork, till it forms a sort of puree. Cream your butter and sugar together in a mixer and add the eggs, banana and milk. 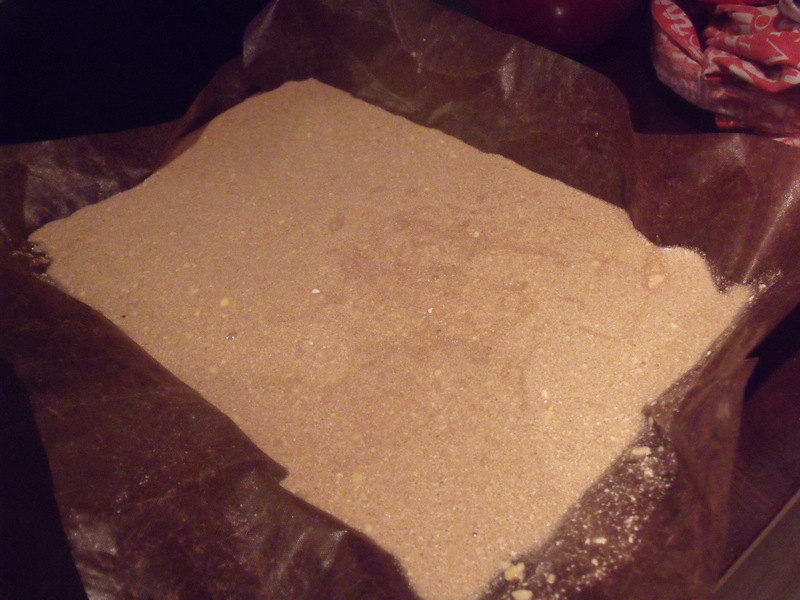 Sift in the flour, add 3 tablespoons maple syrup, and mix it all together. 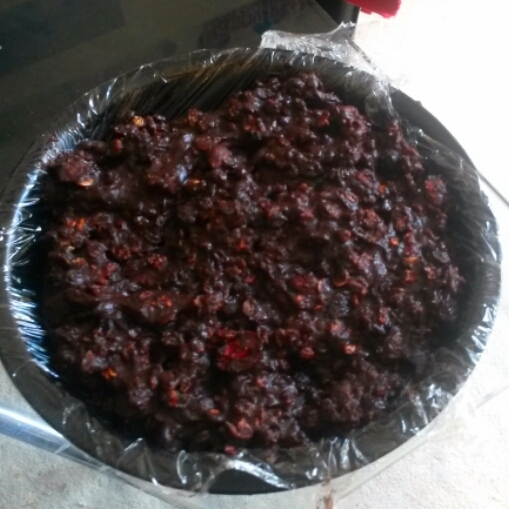 Then add your raisins and nuts, mix together, and then pour the mixture into the baking tray. 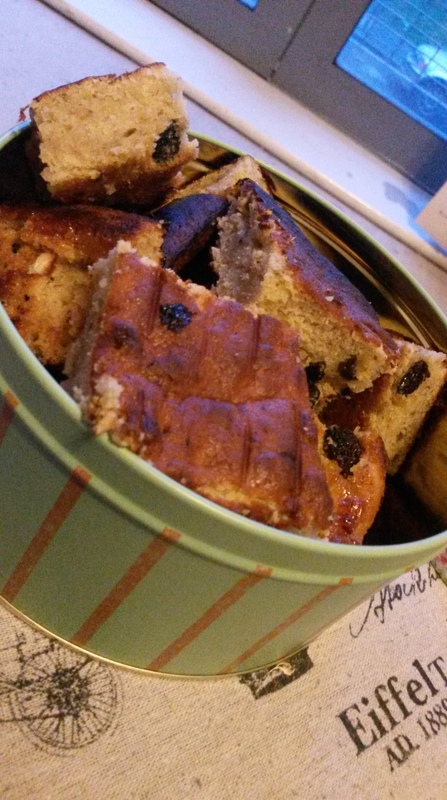 Bake for 25 minutes, turn out on a wire rack and chop into squares. p style=”text-align:center;”>This is a really lovely bake, with a light, moist texture and loads of great flavours. And it has fruit in so you could even say it was healthy (I’m not convinced either!) 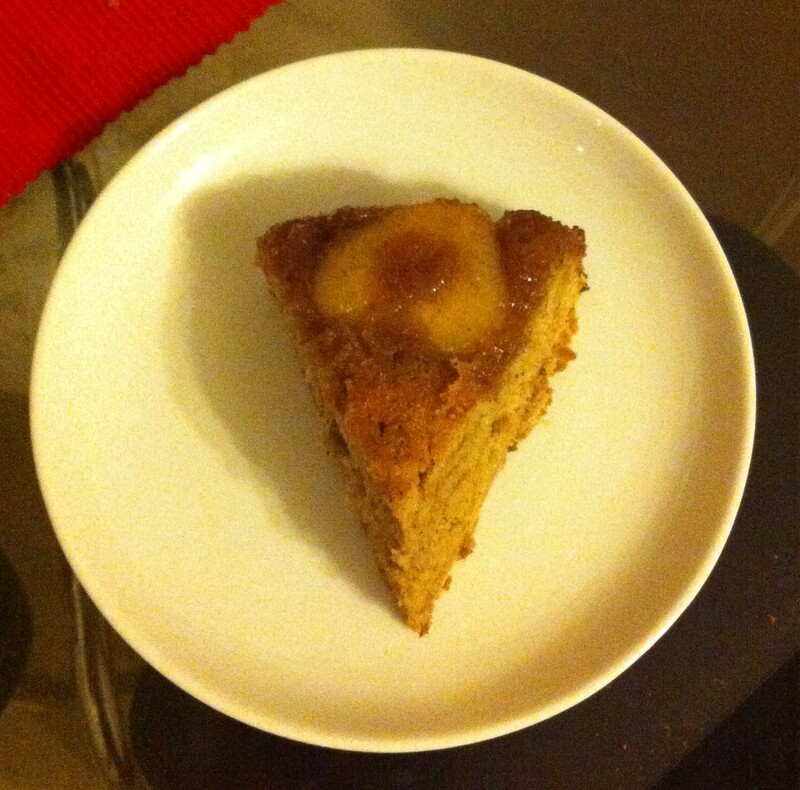 Eat a slice as an afternoon snack with a big cup of tea, or drizzle with maple syrup and enjoy for pudding! I was watching Mary Berry Cooks the other night and she made a chocolate traybake – I thought I’d have a go at my own, I’ve used elements of her recipe (Thanks Mary!) but added my own twist. Instead of the usual cakey texture, this chocolate traybake has a really chewy, sticky fudge texture, with a crunchy top – which I love. You will need:60g hot chocolate (it’s a sweeter flavour than cocoa and fudge should be sweet), 3 eggs, 150ml milk, 1 tsp baking powder, 100g margarine, 275g sugar, 175g self raising flour, 120ml boiling water, 50g white chocolate buttons. Put the cocoa powder and the boiling water into your mixer and whisk it together. Then add in the butter and sugar and mix. Add the eggs and milk and whisk and then add the baking powder and flour. Crush up the white chocolate with a rolling pin into little pieces, add them to the mix and make sure everything is combined. Heat your oven to 180 degrees and line a baking tray with baking parchment. 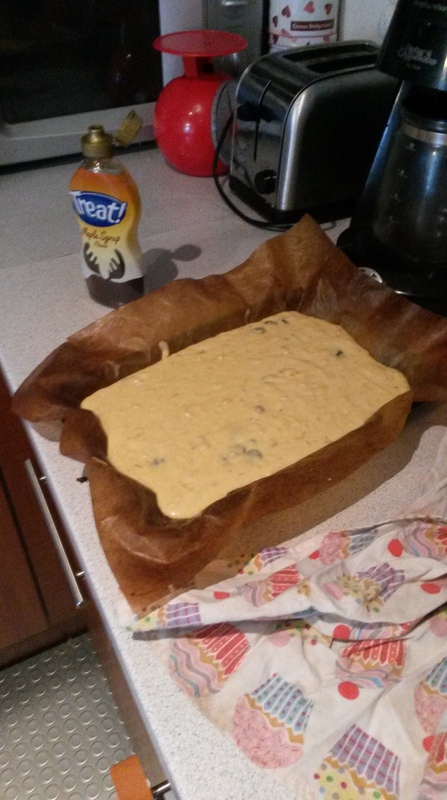 The cake mixture should be really runny and gloopy so you are able to pour it into the baking tray. Place into the oven and cook for 20 minutes. After 20 minutes, turn off the heat and leave your cake in the oven for another 20 minutes. Take the cake out and check it is cooked (pop a knife in the middle- if it comes out clean you’re good). Turn onto a wire rack and leave to cool. 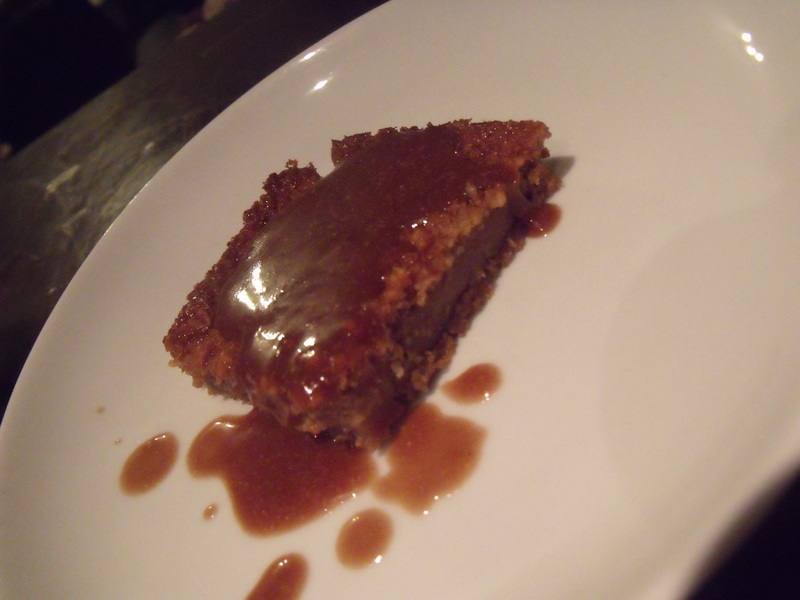 I served this with a homemade chocolate sauce as a dessert – my Swiss Grandma’s recipe, and I will post that soon! If you want to make a really posh dessert, you could use cookie cutters to cut the tray bake into round shapes and smother with homemade chocolate sauce. 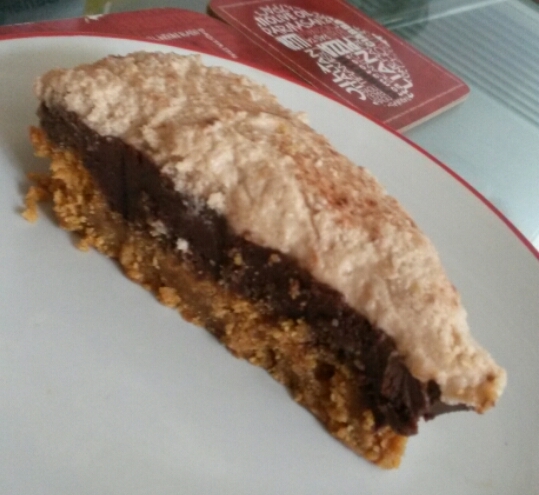 This is a lovely gooey, tasty treat, perfect for having friends over or a slice yourself. I love a good hazelnut mocha – chocolate, coffee and nuts = perfection. So why not make it into a cake? This is a lovely dense chocolate cake with smooth coffee butter icing and a nutty flavour running through the sponge – very luxurious! I haven’t used too much cocoa as it could have overwhelmed the coffee, and with these quantities the flavours are lovely and balanced. 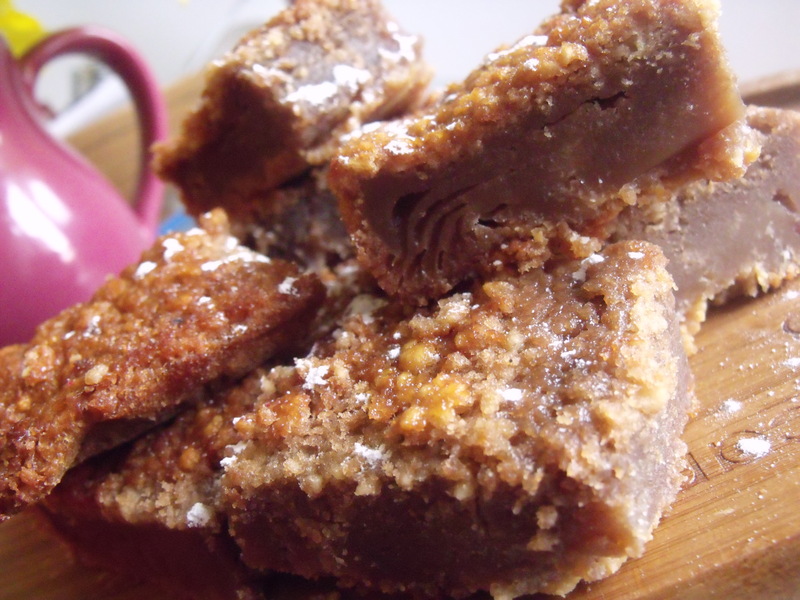 You will need: 200g margarine, 200g caster sugar, 175g self raising flour, 1 tablespoon baking powder, 75g chopped mixed nuts, 30g cocoa (make sure it’s good quality – I used Starbucks hot chocolate powder), 2 eggs, 150g icing sugar, 75g margarine, 1 tablespoon milk, 1 tablespoon strong coffee granules, hazelnuts for decoration. 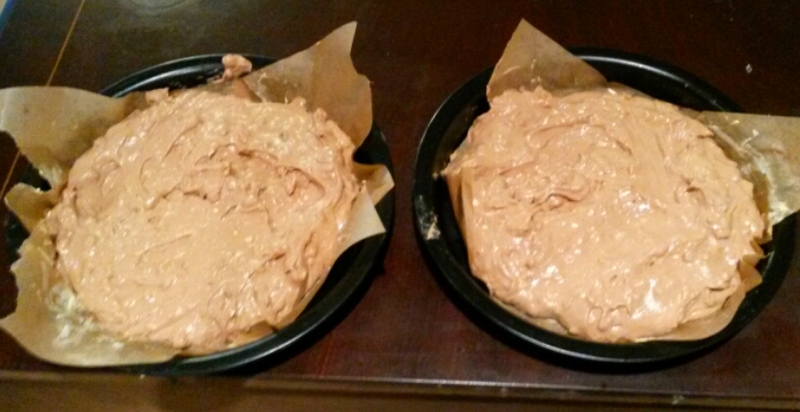 Line two round cake tins with greaseproof paper and preheat your oven to 190 degrees. 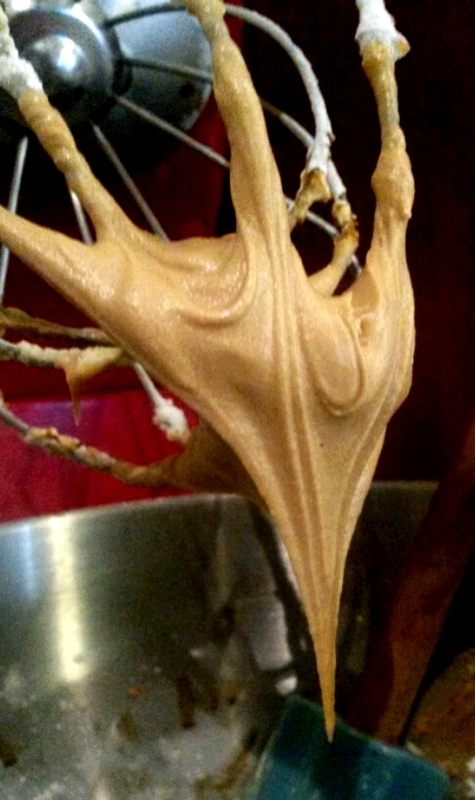 Blend together the sugar and margarine in a mixer, when smooth add an egg at a time until the mixture is combined. Then add your cocoa powder and mix thoroughly, add the chopped nuts to the mixture making sure they are spread evenly throughout the cake. Now sift in the flour and add a tablespoon of baking powder. When everything has mixed together divide the cake mixture between the tins and pop in the oven for 25 minutes. When your cakes have baked, turn them out onto a wire rack and leave to cool. While the cakes are cooling whisk the icing sugar slowly into 75g margarine. Put a tablespoon of milk and a tablespoon of coffee into a mug and microwave it for twenty seconds. 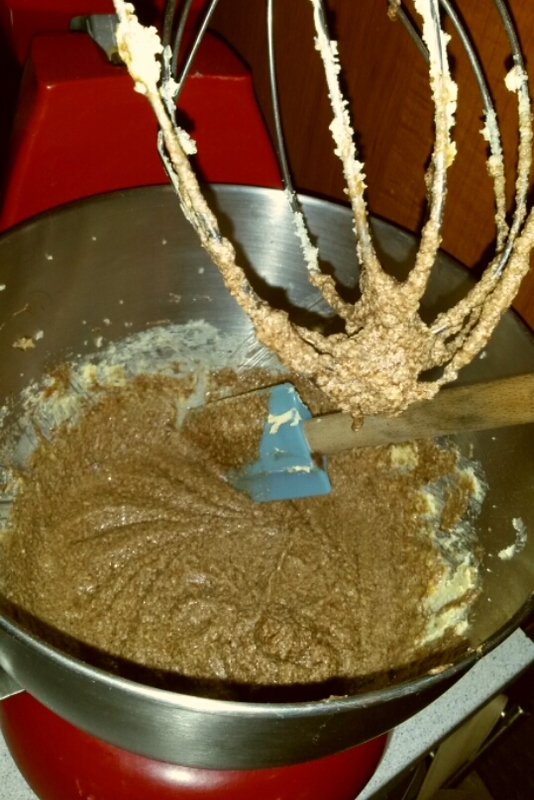 Add the coffee mix to the icing sugar and whisk everything together until it is a nice smooth consistency. 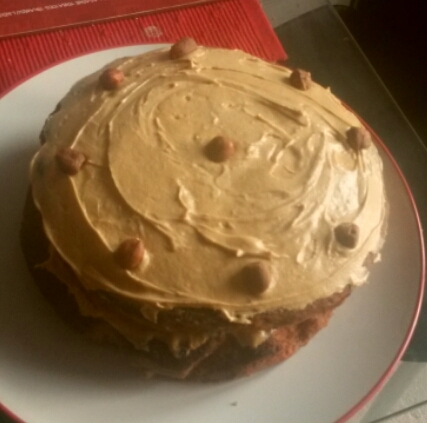 Turn out one cake onto a plate and use half the coffee icing to cover the top if it evenly. Put the other cake on top and ice this, I used a knife to get a nice swirly finish. Then simply decorate the top with hazelnuts. This cake really is gorgeous – perfect for a special occasion, or just a special treat for yourself! Happy Holidays- Ferrero Rocher Cake! Little Runaways reference there for you! 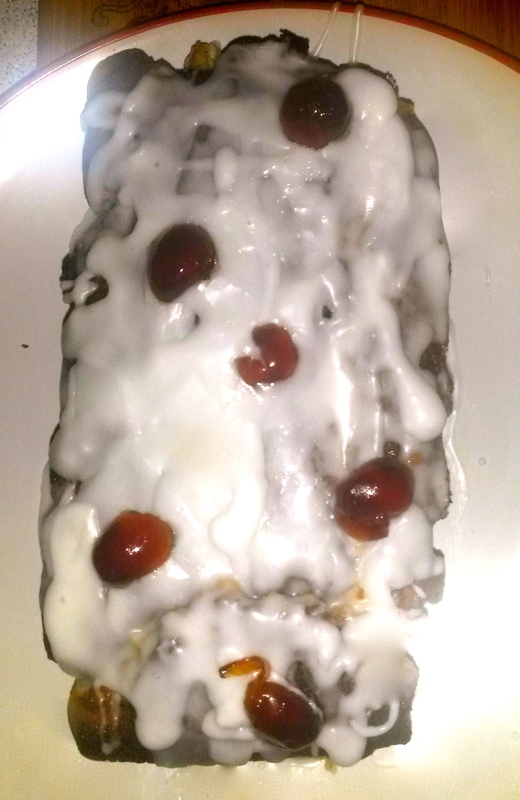 I haven’t baked in ages and I really love having homemade cake in the house, just in case people pop in or we get a bit peckish so I made a lovely cherry loaf cake. Lovely and sweet, full of cherries and vanilla essence, this is my recipe for a thoroughly British cake. 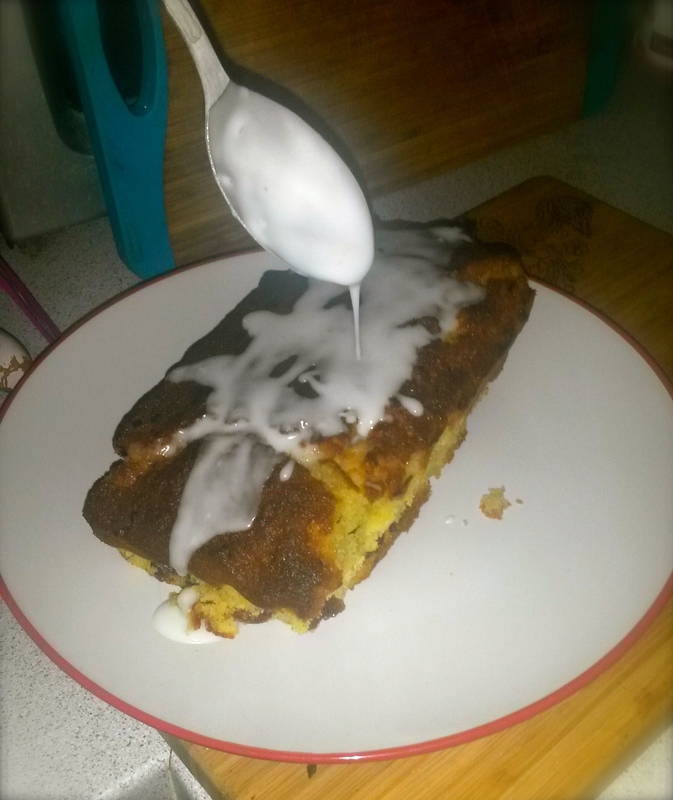 You will need: 6oz self raising flour, 2 tablespoons madagascan vanilla, 6oz sugar, 6oz margarine, 2 eggs, 4 tablespoons milk, 2oz glace cherries (with some for decorating), 300g icing sugar (with a couple of teaspoons of warm water so it is thick and gloopy). Preheat your oven to 200 degrees. First of all cream your margarine and sugar in a mixer. Add the eggs, 1 tablespoon vanilla essence and milk and blend together. Chop your cherries into quarters and add the cherries to the mixture, making sure they are thoroughly combined in the mixture. Sift in the flour and the baking powder and mix everything together. 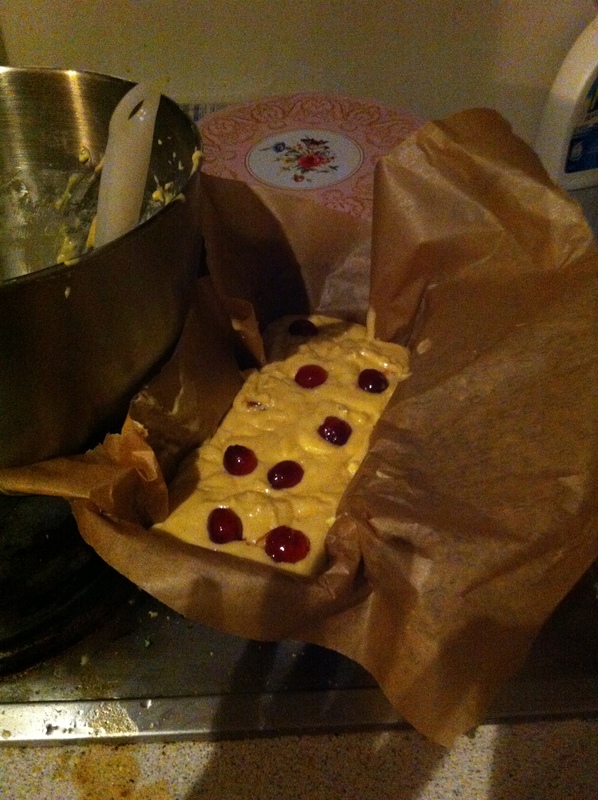 Line a loaf tin with greaseproof paper and spoon the mixture into the tin, popping a few half cherries into the top of the cake. Bake on the middle shelf for about half an hour. 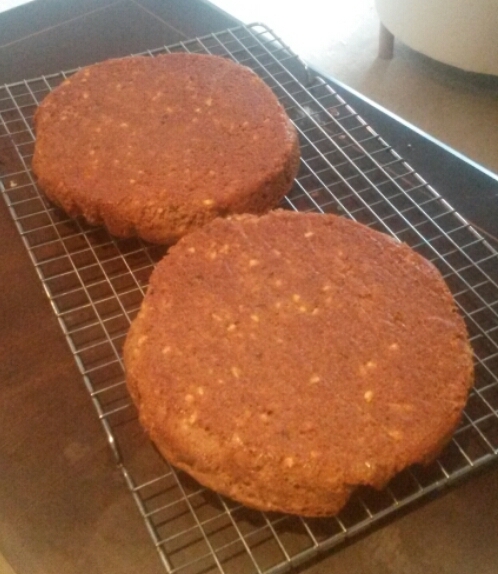 Once your cake is cooked, golden brown on the top and soft and squidgy in the middle. Turn out onto a plate. Mix up your icing in a measure jug and cover the top of your cake with it, I never worry about my cakes looking too neat, but I cut some cherries in half and covered the top with them which looks cute. This cake is probably a bit too summery for Feburary but glace cherries are always a treat no matter the season! I’m not a fan of almonds but if you wanted to add them to put a Bakewell twist on it then feel free, just use less flour. 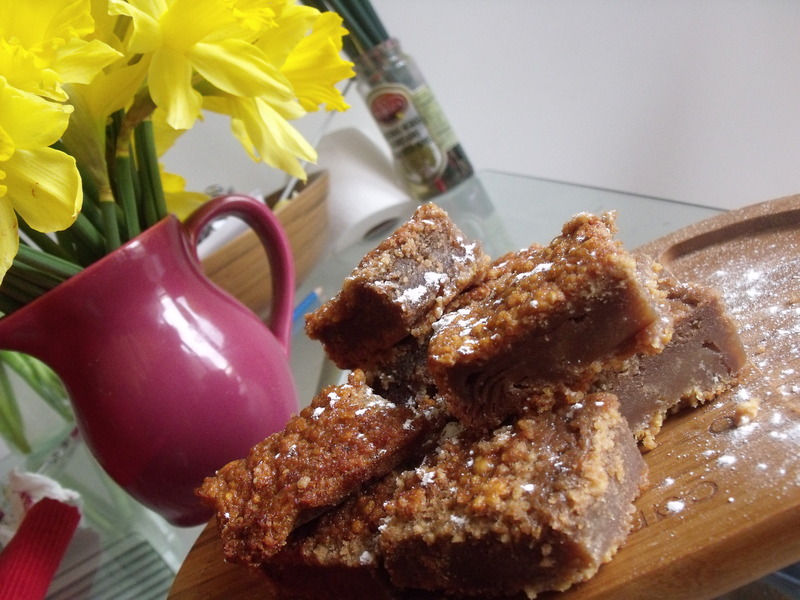 Eat a big slice with a giant cup of tea and think about the summer! Black Forest cake. 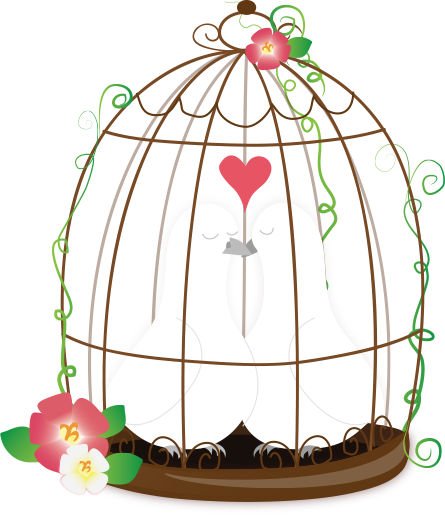 Valentine’s day special . I love Fireball whiskey, I love cinnamon, I love pears. 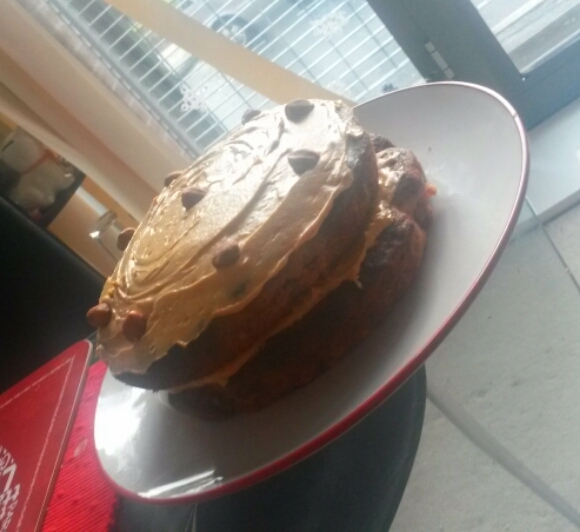 So I made a cake. 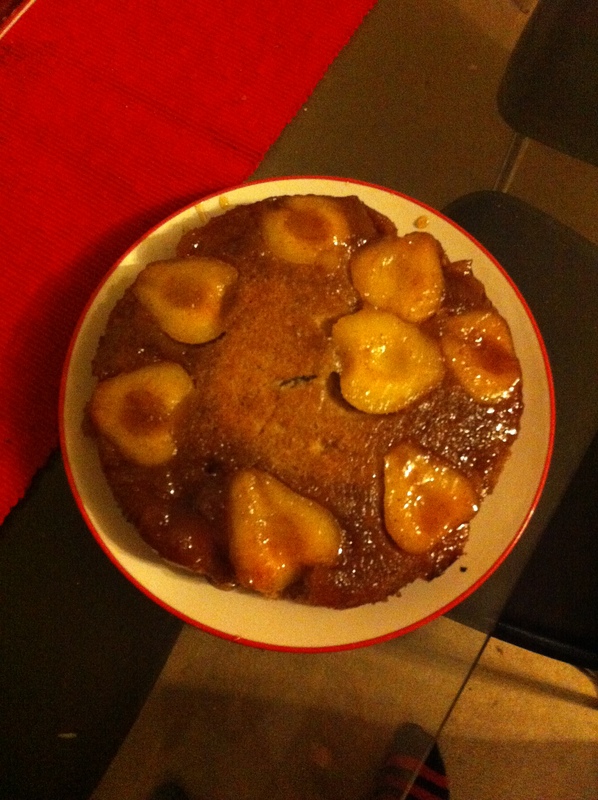 This is a ridiculously indulgent upside down cake, full of booze, spices, pears and sugar. The flavours are lovely and wintery and it is relatively simple to make. If you’re not such a fan of the booze feel free to use less, if you want to use more, I salute you! This is one of my absolute favourite things to bake and one of Sam’s favourite things to eat so sharing my own recipe is a brave step! Let me know what you think! You will need: a springform tin, Fireball whiskey, a good scotch (we used Whyte and Mackay), 8oz caster sugar, cinnamon, 3 eggs, 8oz butter/ margarine, 6oz self raising flour, tin of pears. Preheat your oven to 180 degrees and line your tin with greaseproof paper. 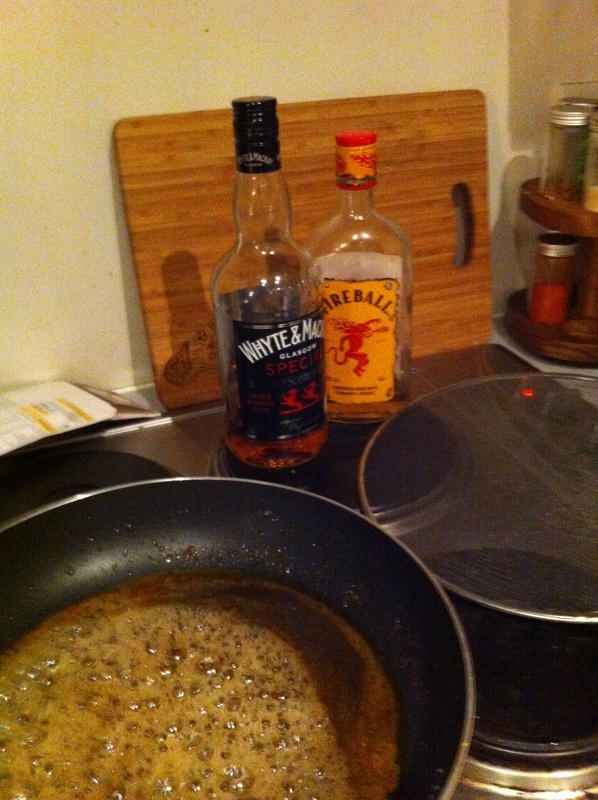 In a large saucepan melt 2oz butter and 2oz sugar together until it forms a syrup, add 2 capfuls of Fireball, 3 capfuls of scotch and 2 teaspoons of cinammon. Drain your pears and add them to the syrup. Heat the pears in the syrup for about 10 minutes. Take the pears out and arrange them on the bottom of your tin. Then cover them with the syrup, add more sugar if you want a thicker syrup. For your sponge, mix 6oz butter and 6oz sugar together. Beat the eggs in a bowl and add them slowly to the mixture. Sift in your flour and add 2 tablespoons of cinnamon, then add two capfuls of Fireball. Mix everything together until you have a lovely smooth sponge. 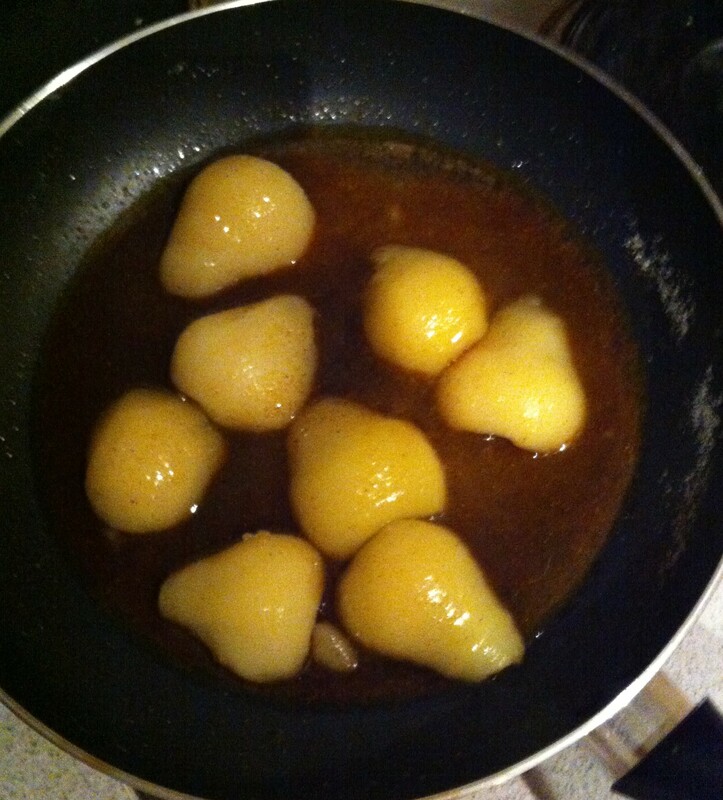 Pour your sponge mix over the pears and syrup in the tin. Make sure the sponge covers all of the syrup and pears. Place in the oven for 35 minutes. Take your cake out of the oven and leave to cool for about 15 minutes. Turn the tin onto a plate, undo the springform tin, and take off the cake. Ta-dah! Sticky syrup, spiced pears and a good hit of whiskey. This is the ultimate cake.